Sky Infoway has created good reputations and rapports with its overseas clients spreading across the world mainly from US, Canada, UK, Australia, and other European countries. Thus, it has a reputed place in the world of outsourcing IT consulting and IT software development companies in India and abroad. 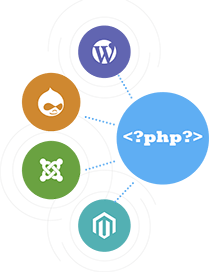 Our web development team is flexible and progressive when you think of contemporary technologies and trends. Therefore, we could grasp the ever-changing PHP technologies easily and have developed approx 100+ quality websites as well as web application using responsive open source technologies. Ideation workshop to define business objectives and solutions needed to solve various challenges faced by the business. Full design, development and back-end integration for the web. We make websites that work seamlessly across all Desktops, Smartphones, and Tablets screens. Provide Cloud Hosting services combined with Uptime commitment driven through SLA. Scale up or down your web service on specific events and 24/7 monitoring of the web solution and infrastructure.